We buy houses in any condition in Hesperia. Fill out the form below and we will give you a fair cash offer within 24 hours. We Buy Houses In Hesperia! Has your house become too much to handle? Does it feel like your house is holding you back? Does thinking about your house cause anxiety and leave you feeling drained? Homeownership in Hesperia can cause a ton of headaches that cost you unnecessary time and money. Now, imagine getting rid of all those feelings by selling your house fast for cash in as little as 7 days, or on the date of your choice. That’s right, you can forget about all your property’s issues! We will purchase nearly any property in Hesperia, regardless of condition. It doesn’t matter whether you live in it, you’re renting it out, it’s vacant, or not even habitable – we will handle all of that, and can even help you or your tenants relocate. Repairs can get extremely expensive. We have purchased properties all over Hesperia just like this one. Forget about fixing up your house – we will take care of it! Over years of work and hundreds of purchased houses, we have come to understand the updated look buyers demand in Hesperia. We are perfectly comfortable giving a fair offer for your house NOW. The current estimated population in Hesperia, California is around 95,000 people, according to the United States Census Bureau. Located in San Bernardino County, California, Hesperia is 35 miles north of San Bernardino. The city is located in an area known as the High Desert, which is a portion of the Mojave Desert with unique moderate weather patterns. 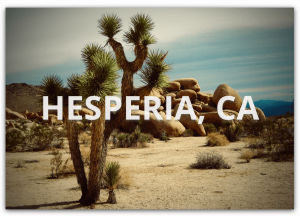 Much of the native flora of Hesperia is classified as California desert vegetation, dominated by junipers, joshua trees and sagebrush. The city’s elevation rises from 3,200 feet in the north to about 4,000 feet above sea level to the south. The San Andreas Fault, a major tectonic plate boundary of the Pacific and North American plates a few miles south of Hesperia in the Cajon Pass, has occasional seismic activity. Hesperia saw significant growth since the completion of US Routes 66, 91 and 395 during the 1940s followed by the introduction of the Interstate 15 to the area in the 1960s. In the 1950s, land developer M. Penn Phillips financed the building of roads and land subdivisions, promoting lots sales on television. They built the Hesperia Inn and golf course which attracted a variety of Hollywood celebrities. The small town of Hesperia grew from 5,000 people in the 1970’s to a moderate-sized community of over 60,000 by the year 2000 – and now a city of around 95,000 people. Hesperia has its own manmade lake (Hesperia Lake Park) on the southeastern edge of the town. This lake is where various town activities are held, including the annual Hesperia Day activities. Camping and fishing are permitted here, as well as Day Kamp and various junior leagues for sports. Just South of The Hesperia Lake Park is the Radio Control Model Aircraft Park – 1700 Arrowhead Lake Road. Home of the Victor Valley R/C Flyers, the R/C Park is open on a daily basis by its members. Saturdays and Sundays are the best times to enjoy watching and flying radio-controlled miniature aircraft. Admission is free and the public is welcome. The city’s golf course is known for its narrow fairways and fast greens. During the 50s and 60s, this course was a stop along the PGA Golf Tour. The course runs from the rift between the “mesa” and the adjoining land on the other side. We are a family-owned company on a mission to change the lives of frustated homeowners in Hesperia. Our team makes it happen.